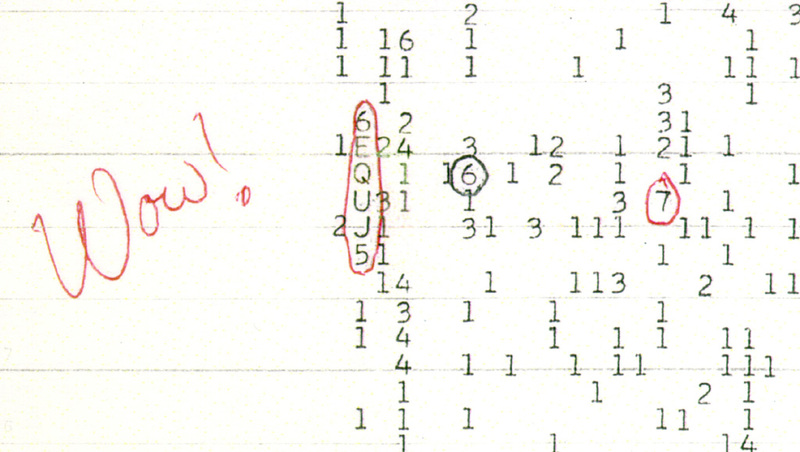 At 11:16 p.m. Eastern Daylight Time on the evening of August 15, 1977, astronomers working on the Search for Extraterrestrial Intelligence (SETI) project at the 'Big Ear' radio telescope at the Perkins Observatory of Ohio State University detected a very unusual signal from space. The intensity of the signal relative to the expected background noise of deep space was so extreme that the reaction of Dr. Jerry R. Ehman, the first person to examine the printout of the recorded data, was to draw a circle around the relevant portion on the sheet and add a single word note indicating his reaction: "Wow!" For this reason, the signal has become known as the 'Wow!' Signal. Despite numerous attempts to find the source again over the ensuing three plus decades, the signal has never been duplicated. Nor has it ever been explained. The pertinent information related to the point of view from which the anomalous data represented by the 'Wow!' Signal must be considered includes the fact that to date there is no credible evidence of life existing elsewhere in our universe beyond our own planet. Although some scientists have conjectured that the almost unimaginable vastness of the cosmos, with its billions of galaxies and trillions of stars, suggests statistically that it is exceedingly improbable that we are alone, as yet we have no evidence to the contrary. This extraordinary situation is known as the "Fermi Paradox". We should also remember the fact that the observations recorded at the Big Ear observatory were part of the Search for Extraterrestrial Intelligence. This may have led to the information being interpreted in a way that would not have been the case in other circumstances, such as more mainstream astronomical investigations. Our own individual interpretations may also vary according to the point of view from which we approach such phenomena as the 'Wow!' Signal. Certainly, many people are quite prepared to accept the existence of extraterrestrial life almost as a given, while others demand a much higher level of proof than is generally accepted as having been provided to date. Maggie Starbard/NPR An illustration of detail from the "Wow!" document.